AvoDerm Natural Lamb Meal & Brown Rice Formula Adult is low-priced dry dog food with average quality. This product has no controversial ingredients, including no artificial preservatives, colors, or flavors. The food has a high amount of carbs compared to its protein and fat - but excellent meat and fat quality. AvoDerm as a brand has an average number of recalls and the company was not responsive or open when answering our transparency questions. This food is high in carbs and low in protein and fat, making it less nutritionally balanced compared to other dog foods we evaluated. Carbohydrates are cheap so they keep the food’s cost low and they are nutritionally useful to dogs in the right amounts. However, high amounts of carbs can reduce the much-needed meat-based protein and fat content. Lamb Meal, Ground Brown Rice, Ground White Rice, Oatmeal, Rice Bran, Pea Flour, Chicken Fat (Preserved with Mixed Tocopherols), Herring Meal (Source of Omega 3), Avocado, Flax Seed, Natural Flavor, Dried Tomato Pomace, Alfalfa Meal, Potassium Chloride, Salt, Kelp Meal, Vitamins (Choline Chloride, a-Tocopherol Acetate (Source of Vitamin E), L-Ascorbyl-2-Polyphosphate (Source of Vitamin C), Biotin, Niacin, Calcium Pantothenate, Vitamin A Supplement, Riboflavin Supplement, Thiamine Mononitrate (Source of Vitamin B1), Vitamin B12 Supplement, Pyridoxine Hydrochloride (Source of Vitamin B6), Vitamin D3 Supplement, Folic Acid), Minerals (Zinc Sulfate, Ferrous Sulfate, Iron Amino Acid Chelate, Zinc Amino Acid Chelate, Selenium Yeast, Copper Amino Acid Chelate, Copper Sulfate, Manganese Sulfate, Manganese Amino Acid Chelate, Calcium Iodate), Avocado Oil, Rosemary Extract, Sage Extract, Pineapple Stem, Papaya Extract, Dehydrated Lactobacillus Acidophilus Fermentation Product, Dehydrated Lactobacillus Casei Fermentation Product, Dehydrated Bifidobacterium Thermophilum Fermentation Product, Dehydrated Enterococcus Faecium Fermentation Product. The average dog food we reviewed had 39 total ingredients, with 1 controversial ingredient. This product does not have any controversial ingredients, that’s great. Brown rice is whole-grain rice with the inedible outer shell removed. It provides calories, complex carbohydrates and a few other nutrients to dogs. We generally consider it a quality dog food ingredient. Rice bran is the hard outer layers of rice. It provides calories, fiber, carbohydrates and a few other nutrients. We generally consider it a quality dog food ingredient. The AvoDerm Natural Lamb Meal & Brown Rice formula does not contain any ingredients that we consider to be controversial. AvoDerm is manufactured in the United States. Because of the FDA and consumer standards, dog food products made in the US are expected to be of a higher quality. This product is looking good for meat and fat quality. It has 2 different meat meals, that are both naming the animal source they come from. Lamb meal is the first ingredient, and Herring Meal a bit further down on the ingredients list. For fats, chicken fat is listed which is a leftover from cooking chicken parts and is a popular fat source that provides Omega-6 fatty acids. AvoDerm does not have any controversial preservatives in this formula. It’s good to know that ‍not all artificial preservatives are bad. That’s because they serve an important purpose, which is to prevent food from spoiling. However, we consider 11 artificial preservatives as controversial because of their potential link to cancer and other serious health conditions. 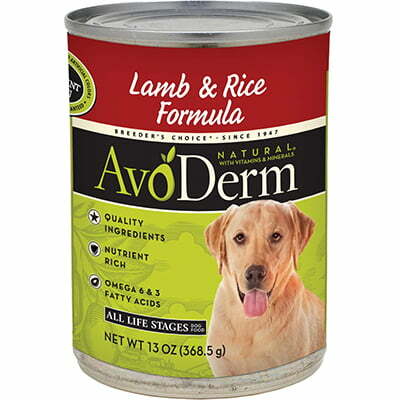 AvoDerm does not use any artificial colors in their Natural Lamb and Brown Rice formula. 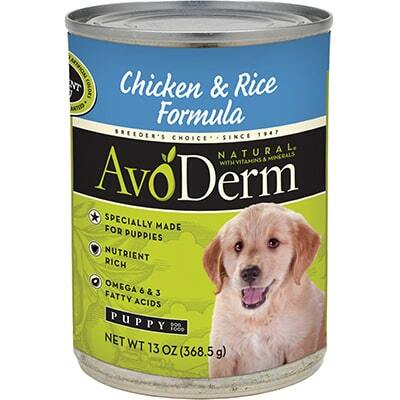 AvoDerm also does not use any artificial flavors in this formula. AvoDerm is made by a company called Breeder’s Choice which has an average amount of dog food recalls. Breeder’s Choice Active Care Healthy Joint Treats (for dogs), 24 oz. pack, Best by Dec. 19, 2013. 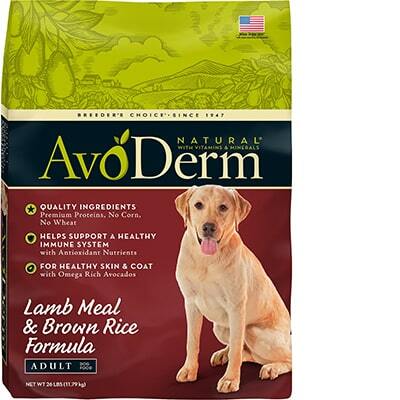 AvoDerm Natural Lamb Meal & Brown Rice Adult Dog Formula, 26 lb. Packaged in plastic bag with plastic liner. The firm recalled because the product has the potential to be contaminated with Salmonella. ‍Avoderm was contacted twice over a 3 week period. A response was given that they had forwarded the email to the correct department, but no follow up was received.